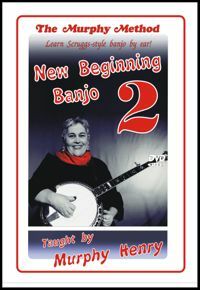 Gina Furtado, banjo player with Chris Jones and the Night Drivers, cut her banjo teeth taking lessons from Murphy. Now she slides into the instructor's chair to share some of her distinctive style with you. 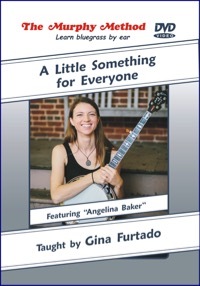 These intermediate to advanced arrangements of Angelina Baker, Big Sciota and Cold Frosty Morning (which are all popular fiddle tunes), Edelweiss, and Last Frost (an original tune) will stretch your banjo knowledge. They incorporate melodics as well as some single-string work. Watch a clip and order it here. 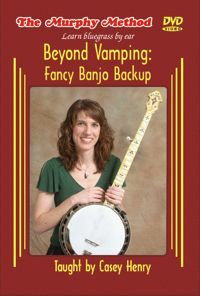 Backup is one of the most-requested topics to cover at our banjo camps. 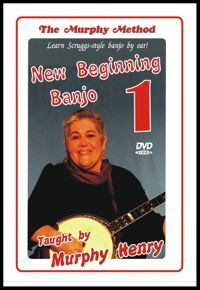 You can get some in-depth knowledge of fancy Scruggs backup on this disc. It starts simple with a couple little moves to spice up your vamping, and then builds up to full-on up-the-neck backup patterns. On sale this month for $14.98. Watch a clip and order it here. Newly Recorded in High Definition, Updated, Expanded, Improved! 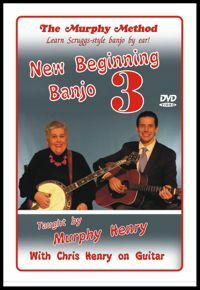 New HD Beginning Banjo DVDs Are Here! We've recently updated our recommended song order for all levels of our DVDs. Because our method and material were developed over many years, we've found better ways to teach now than just plowing straight through each DVD. Take a minute to look over our ideal order for learning at every level. These are for the original releases of the DVDs. If you have NEW Beginning Banjo 1, 2, and 3 just go straight through, and don't stray from the path! All camps are held in Winchester, Va., and taught by Murphy and Casey Henry. To see details visit our camps page. Sign up to receive our monthly email newsletters by clicking here.